Cranberry jelly hue with aromas that are rustic, with a touch of forest floor, fresh cherry and cherry cream. Palate--Lively mouth feel with vibrant acidity that makes my mouth watering, leaving a moderate wake of tart red fruit and a fleeting finish. 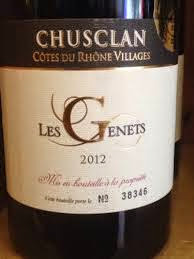 This blend of 5 Rhone grapes is predominantly Grenache which is what carries the day. This sells at a $17 price point but you can find it for a good bit less if you hunt. It's an interesting blend and a good food wine for which I say, "Raise a glass!"